I'd like it known that I was on my way to the movies when I realized that I hadn't put this one up yet. Ah, but I'd rather have pseudo-philosophy than these uncreative "like" things another person thought of, which accumulate like iron shavings to a magnet in my news feed. 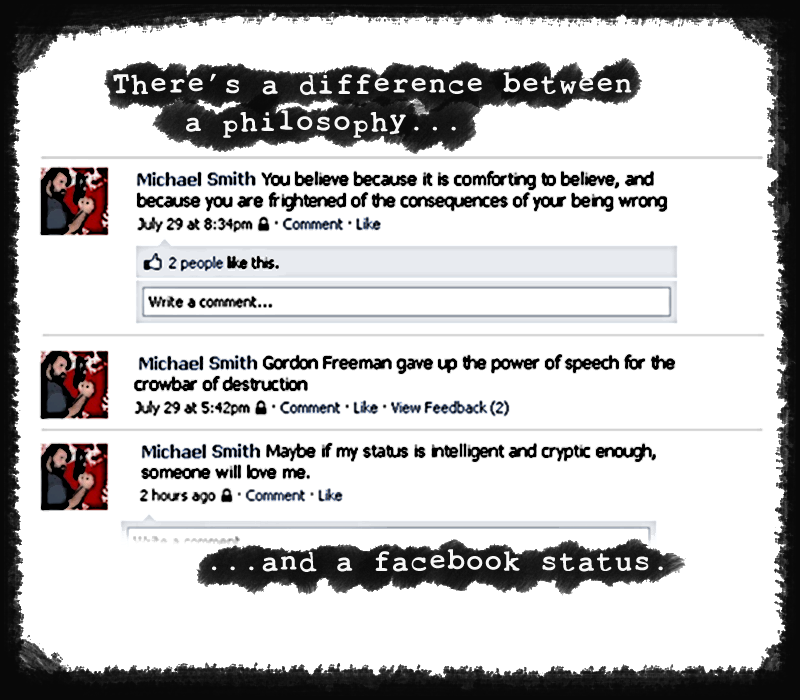 Oh god, those "like" pages are the WORST of the pseudo-philosophy running rampant on the internet. I find it somewhat ironic that I now have a 'like' button beneath my comic. Which shall be pressed by thousands. Also, I totally quoted the believing status update. Right now me and my old school teacher are going at it and she is as shallow as hell. That's a quote from a short story I read a while ago about an Atheist on judgment day. Eventually I'd like to do a several multi-page comics on that story and another short story I read a while ago on a similar subject.